Rocco Francis Marchegiano was born on 1 September 1923, in Brockton, Massachusetts USA, to Pasqualina Picciuto and Pierino Marchegiano, of Italian descent. Far better known as Rocky Marciano, he was a professional boxer, a world heavyweight champion who held the title for four years and went undefeated his entire career. A legendary boxer, how wealthy was Rocky Marciano? 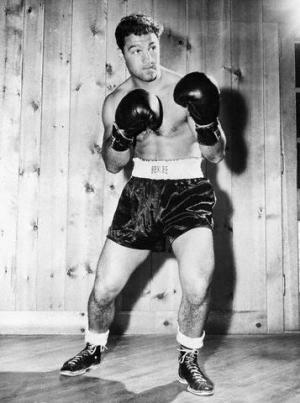 Sources state that Marciano had acquired a fortune over $1 million, accumulated largely during his boxing career. Marciano grew up in Brockton, along with his five siblings. When he was a toddler, he contracted pneumonia and almost died. He attended Brockton High School, where he excelled in baseball and football, however, he dropped out of school after his tenth grade and went on to take several jobs, such as a chute man on delivery trucks, floor sweeper and shoemaker. In 1943 he was drafted into the Army and sent to Wales, taking part in the D-Day landings in Normandy. He finished his service in 1946, but while awaiting discharge, he represented his unit in amateur boxing fights, winning the 1946 Amateur Armed Forces boxing tournament. The following year he turned pro, defeating Lee Epperson by knockout in three rounds in his first bout, however, soon after he returned to amateur boxing, and later attempted to make it to the Chicago Cubs baseball team, but was cut. In 1948 Marciano returned to professional boxing, defeating Harry Bilizarian, and went on to win his first 16 fights by knockout. His boxing skills began to gain him attention and his net worth began to rise. Several more knockout wins followed, including matches against Ted Lowry, Phil Muscato and Carmine Vingo. In 1950 he faced undefeated Roland La Starza, and won by split decision. He went on to three more knockout wins before defeating Lowry in a rematch by unanimous decision. He kept his winning streak, and in 1951 won against Rex Layne by knockout, being showcased on national television for the first time. His popularity and net worth was rising. After scoring several more wins, including against Joe Louis, Lee Savold and Harry Mathews, he faced Jersey Joe Walcott for the world heavyweight championship in 1952. Although knocked down in the first round, which enabled Walcott to get a points lead, Marciano won in the 13th round and became the new Champion, which further boosted his popularity and significantly improved his wealth. He went on to successfully defend the title six times, five by knockout. His title bouts included a rematch against Walcott and a rematch against La Starza in the following year, two consecutive bouts against former World Heavyweight Champion and light heavyweight boxer Ezzard Charles in 1954, then a match against British and European Champion Don Cockell in 1955, and another against Archie Moore later that year, which was his last title bout. All added to his net worth. In 1956, Marciano announced his retirement from professional boxing, being aged 32 and having a remarkable record 49-0, with 43 of his wins by knockout. Following his retirement, he became involved in television, serving as the host of a weekly boxing show. He briefly served as a troubleshooting referee in wrestling, and then as a referee and boxing commentator in boxing matches for a longer period. In addition, he became a partner and vice president of a franchise company called Papa Luigi Spaghetti Dens. He also made money from personal appearances at various events. In 1969 he was included in filming a fictional bout between himself and Muhammad Ali, as the only two undefeated heavyweight champions ever, called “The Superfight: Marciano vs. Ali“. Speaking about his personal life, Marciano married Barbara Cousins in 1950; they had a daughter and an adopted son. The couple remained together until his death in 1969, killed in a tragic plane crash on his way to Iowa, a day before his 46th birthday. Marciano’s wife died of lung cancer five years after his death. 1 A good all around athlete as a kid, he played Football and Baseball. He was known for his enthusiastic and intense pre-bout training. His early conditioning would be considered unorthodox for Boxing. He favored multiple sets of push-ups, chin-ups and extensive barbell training (which was considered strictly taboo in the conventional boxing wisdom of the day). He even was an exponent and graduate of the famous Charles Atlas Dynamic Tension mail order course. From: The Ring Magazine. 2 His right hand knockout punch against Rex Layne sent Layne's mouthpiece 10 feet across the ring and sheared off 4 of Layne's front teeth at the gum line. 3 Inducted into the Rhode Island Heritage Hall of Fame in 1976. 4 Won his first 16 fights by knockout. 5 Wanted to be a professional baseball player. 6 Knocked out Muhammad Ali in a controversial fantasy "Computer" super-fight in 1969. Ali complained that the computer was made in Georgia. 7 Defeated world champions Joe Louis, Jersey Joe Walcott, Ezzard Charles and Archie Moore. 8 As an amateur lost a decision to Coley Wallace. 9 Inducted into the World Boxing Hall of Fame, 1980. 10 Inducted into the International Boxing Hall of Fame, 1990.